What Influences Follow-Up After Gastric Bypass Surgery? Bariatric surgery remains the only effective and enduring treatment for morbid obesity. Even after bariatric surgery, obesity is recognized as a chronic disease requiring appropriate follow-up. We hypothesized that certain patient characteristics may influence 1 year follow up. Bariatric surgery clinic records from an academic medical center were reviewed from 2004- 2006. Patients were divided into two groups: (A) patients who had 1 year clinic visits vs. (B) patients who did not have 1 year clinic visits. Categorical and continuous variables were compared by Chi-Square and T- test respectively with P30 miles from clinic. 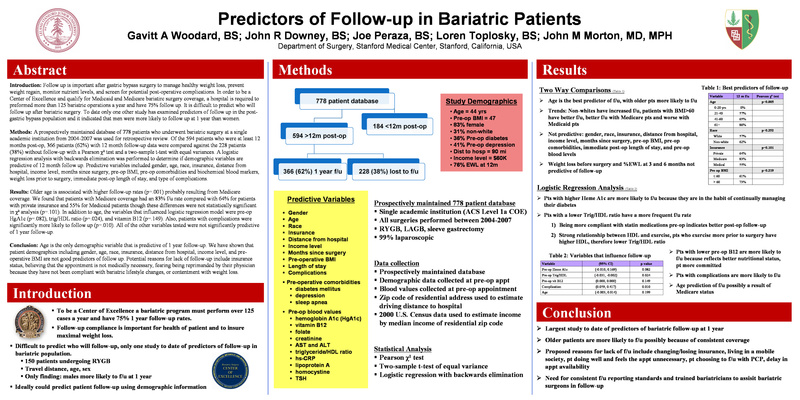 Follow-up of bariatric surgery patients is integral to long-term success. This study has identified that age, comorbidities and distance from clinic influence follow up at 1 year indicating that these patient groups may require additional surveillance.